PRESS RELEASE. 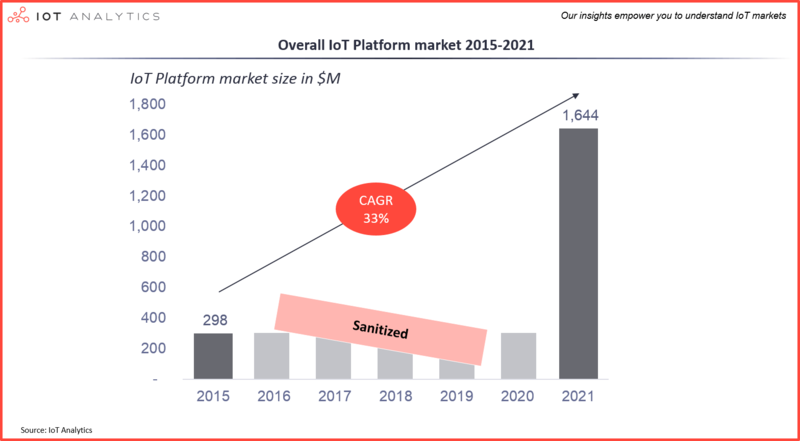 Hamburg, Germany – 19 Jan 2016 // IoT Analytics, a leading provider of market insights for the Internet of Things (IoT), today published a comprehensive Market Report, focusing on sizing the opportunity of the IoT Platform market for the period 2015 to 2021. The emerging IoT Platform market continues to exhibit strong momentum as businesses accelerate their transformation into IoT data-driven companies. This momentum is driving strong growth in IoT Platform-related hardware, software and integration services for connected business solutions. A new forecast from IoT Analytics sees the IoT Platforms market growing at a compound annual growth rate (CAGR) of 33% over the 2015-2021 forecast period, with annual revenue reaching $1.6 billion in 2021. 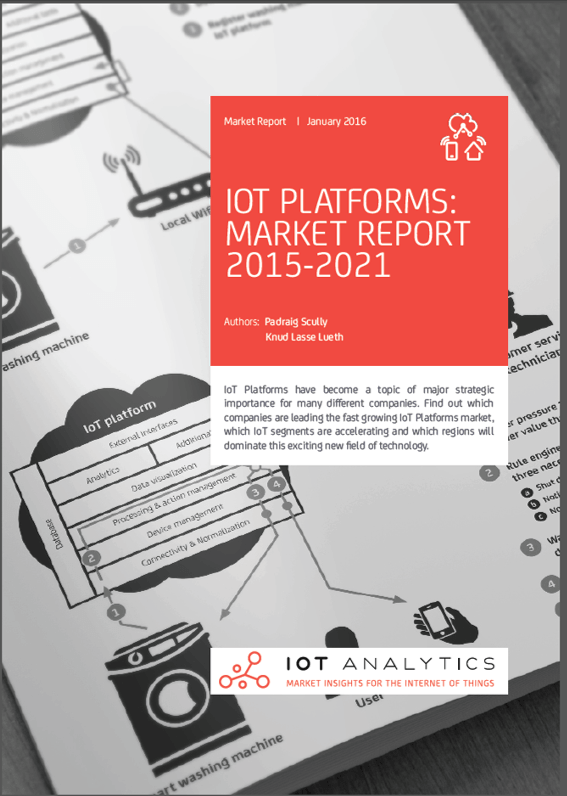 The new IoT Platform Report examines (expected) revenue of the IoT Platform market in greater detail across 10 vertical-industry segments and 7 regions with deep dives into North America, Europe and Asia. To better understand the market players IoT Analytics profiles 12 of the top IoT platform providers, estimates corresponding market share and outlines 90 other notable contenders. The new study also describes the top 5 trends affecting IoT platforms as the fast growing market is being transformed by increasing M&A and funding activity (see Report Structure below). Commenting on the findings, IoT Analytics Managing Director Knud Lasse Lueth said: “We are currently witnessing an explosion in IoT deployments and solutions around the world. IoT platforms are emerging as the central backbone of these IoT deployments and are the key for the development of scalable IoT applications and services. IoT Platforms represent a truly new market segment that was almost non-existent a few years ago. Despite its tremendous diversity, the $300M market is currently dominated by US vendors with PTC emerging as the market leader at 18% market share. The US is also currently the biggest market for IoT deployments using IoT platforms. However, we are seeing that Asian markets are starting to pick up and do expect Asia to emerge as the biggest continental market by 2021”. 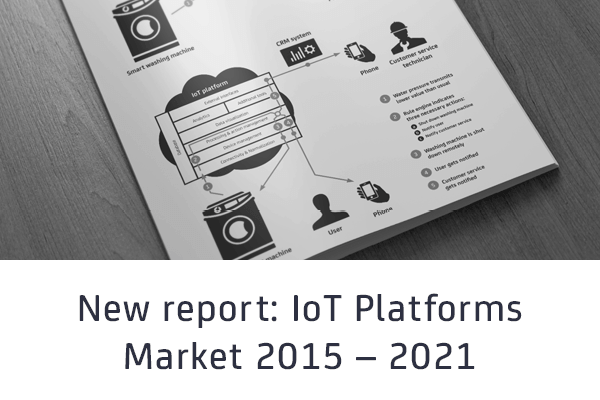 The IoT Platform Report is available to download HERE. The role of IoT platforms within the Internet of Things. IoT platforms: A new market segment – not just a natural evolution. The role of IoT platforms in overall IoT solutions. Technology: The 8 major building blocks of an IoT platform. Market segmentation: 3 lenses to look at IoT platforms. Seven leading IoT platform use cases demonstrate the value of IoT platforms. Company profiles and SWOT analysis of 12 leading IoT platforms. IoT platform provider’s internal structure and partner relationships. The top 5 trends in the IoT platforms market. Major obstacles for further market expansion. 2lemetry, Accenture, Amazon, Analog Devices, Alcatel-Lucent, Apple, Arrayent, Artik, AT&T, Ayla Networks, Autodesk, Axeda, BlackBerry, Blacksumac, Bosch, Carriots, Cisco, CloudPlugs, Davra Networks, Ericsson, Evrythng, GE, Good Technologies, Google, Greenwave Systems, Huawei, IBM, iControl Networks, Jasper, LogMeIn, Microsoft, Mnubo, Motorola, Murata, myDevices, Nokia, Oracle, Qualcomm, Predix, ProSyst, PTC, PubNub, Relayr, Salesforce.com, Samsung, SAP, SeeControl, Siemens, SmartThings, ThingWorx, Verizon, Vuforia, Wipro, wot.io, Xively, Zebra Technologies.